Articulated Water Delivery System: Simply put, the manual version of this concept is the hand pour kettle. Unlike a simple hot water boiling kettle, this version is designed with flow rate control in mind and the end user has an approximate but not precise control over the temperature. AWDS implies pouring where you want it at a flow rate you are trying to control. This is an important concept to think about when considering the usefulness and value of having control over flow. For the kettle though, this is an art form that takes an exceptionally long time to master. The difficult learning curve of balancing a kettle to get optimal flow presents a problem all it's own. We can easily find other problems with nearly every option available for hot water delivery. They are inefficient, time consuming, and often impractical. So, let's take a moment to evaluate our options. Table top boilers dispense water but you need to transfer that water to another container or bring the brew device to the water source. These boilers range from a large water tower down to a simple Zojirushi water boiler. These are always on and run continuously, tend to be very energy inefficient and the water is often stale. Small hot water kettles are typically electric and boil water on demand. The main problems being that they need to have time to get up to boil and cannot handle any significant volume with speed. 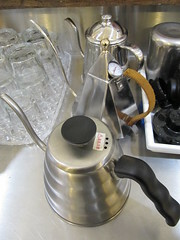 While fine for home use, they become increasingly impractical in cafe settings where any real volume is present. The standalone brewer would be the so called 'per cup concept' that requires either a new brew method adoption or for the user to work with an entirely revised set of brew physics. 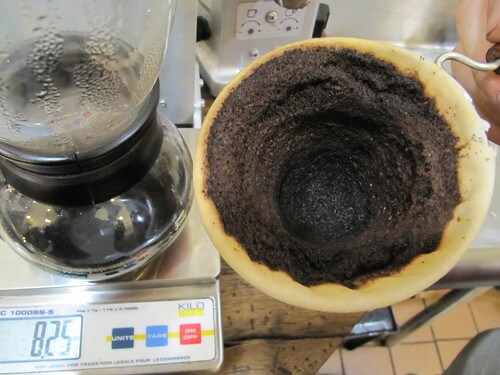 The goal is often a tweaking of variables to attempt a quicker 'per cup.' This self contained brewer uses some new fancy way of brewing to set itself aside by trying to 'reinvent the wheel.' This kind of design concept is not only often expensive, it can easily have many flaws in design that may not show up until many users are out there testing it in real world scenarios well into sales and production. The real problem being that cup quality was often secondary to speed to balance the third item, cost. So we acknowledge the problems and the question is, what's the solution? An AWDS that uses technology to provide flow controls and temperature controls would meet the need. It would not be a brewer by itself. Instead, it would provide hot water at precision controlled temperatures and adjustable flow rates through an articulated 'wand'. This would theoretically be the hot water delivery system that worked with all brew methods that could benefit from precision water temperatures and adjustable flow rate controls. 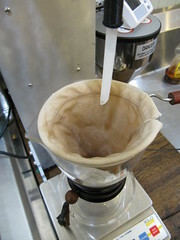 All existing and widely used hand pour and general pour over methods would benefit from this system. Instead of trying to create a new standalone brew system with new brew physics, a group of engineers have spent the last two years developing a hot water delivery system that functions as an AWDS. After an initial goal of stable temperatures and fixed flow rates, they have now tuned the device to respond to temperature and flow rate changes. That is unprecedented and as yet a largely unexplored avenue of brewing coffee outside of a few lab situations. This would be an exteremly useful item for chemex lovers and melitta fans, but the real novel application seems to be when you tie in a product invented in 2006, the v60, it gets exciting. 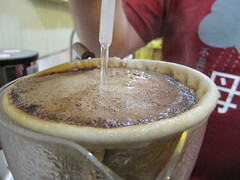 The v60 is designed in such a way that the flow rate of the water has an effect on the cup profile of the brew and adds another point of control. When used incorrectly or carelessly, it's a detriment to the resulting taste which creates a bit of a learning curve. The benefit of this control is that tied to a water delivery system with an articulated spout, dynamic temperature control, and adjustable flow rates, you have every variable in pour over brewing under control. Using technology to assist in brewing with an already familiar method speeds up the process to the point that brewing per cup now becomes very attainable in most cafe settings. Instead of reinventing the wheel, they came up with a design that works with all wheels making them more finely tuned and faster.